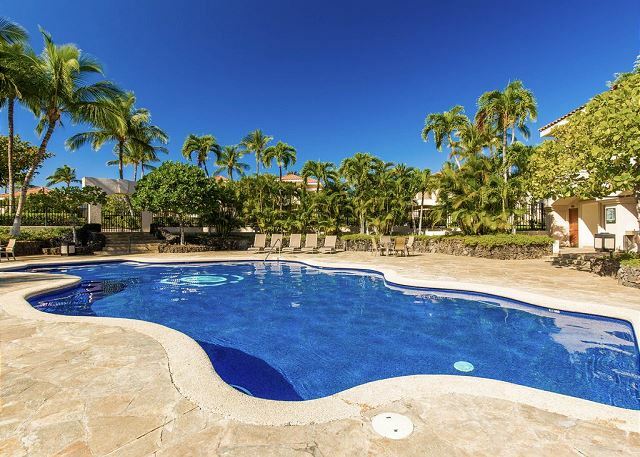 This well-placed Waikoloa Beach Resort condo has an abundance of light and a roomy, airy atmosphere. 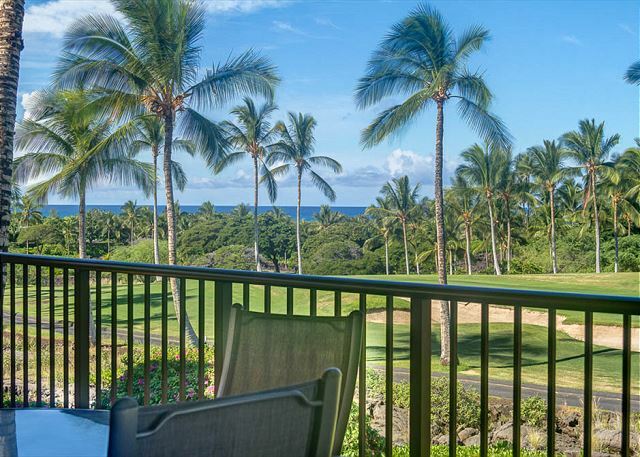 A practical location near the property entrance makes it easy to walk to a range of attractions including the Hilton Waikoloa Village for shopping and dining excursions, and A-Bay beach and its surrounding fishponds. 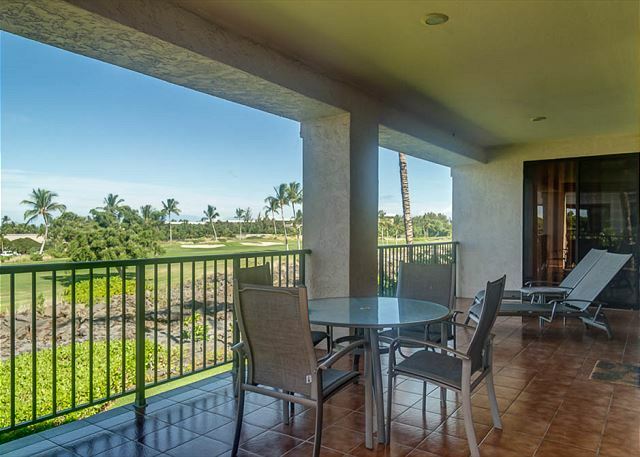 But you will find all you need right here in this scenic spot with its high ceilings, numerous windows, and generous wraparound lanai fronting the 13th green of the Beach Golf Course. Views of sunsets over the sparkling ocean waves are exquisite. Enjoy the well-equipped kitchen with modern appliances and unique granite counters, a formal dining area, two large master suites, a computer workstation, and plenty of storage space, among the great features here. 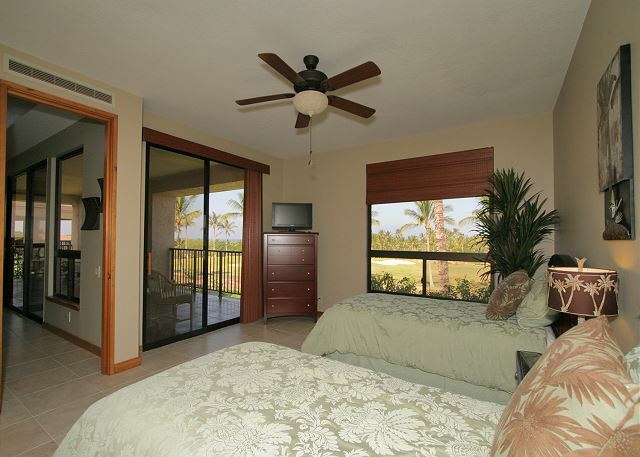 Bedrooms have private access onto the lanai. 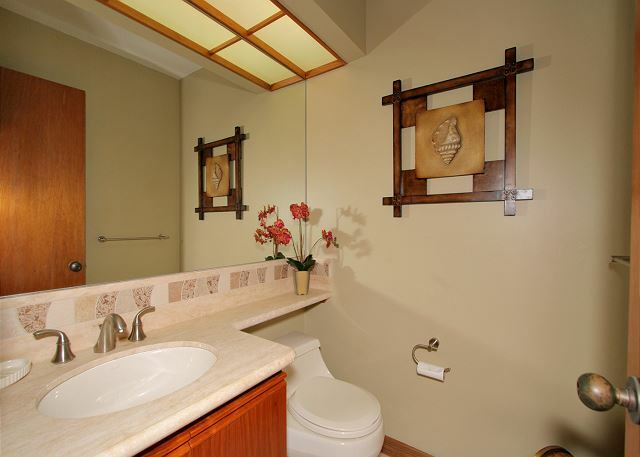 Each bathroom contains an over-sized tub and separate shower plus double vanities. This model works particularly well for two couples or families, with its private bedrooms situated on opposite ends of the unit. 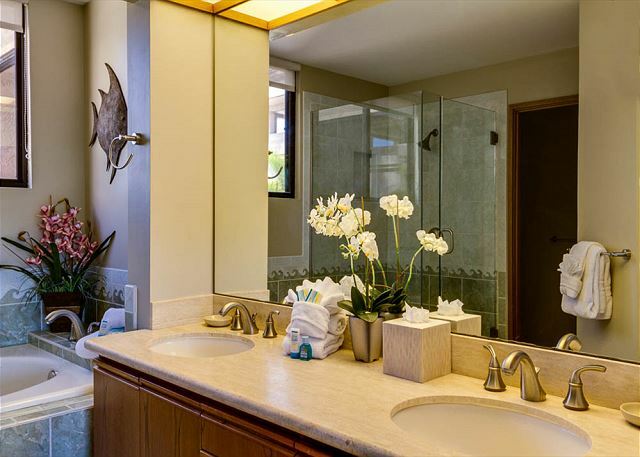 There is a powder room off the main living area. Guests have use of beach supplies, a large collection of books and a few games. Each room is equipped with a TV. A carport is located right next to the main entryway. Beautiful place, would stay again. Villa 7 was nicely decorated but the beds were uncomfortable, maybe a mattress toppers would help. Pool and hot tub was great! Villa had everything we needed even beach items. Main bathroom was not working for our entire stay but we did fine since each bedroom had a master bathroom. Loved that parking was in carport right in front of Villa. Peggy with Waikoloa Reality was wonderful! She answered questions quickly and accommodated us with another place due to our flight leaving late, she definitely provides excellent customer service. Peggy you need a raise! The location of this condo is excellent and the view equally good. 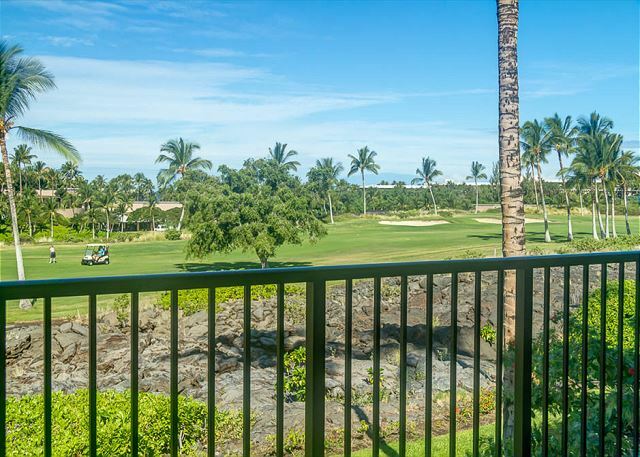 The lania was the unit’s best feature; large, gentle breezes and a great view of the golf course and ocean views, You can also hear the ocean in the early morning and in the evening. The unit itself is dated and in need of some upgrades, but we overlooked that due to the the location and lania. Peggy at the property management company was very professional and helpful. 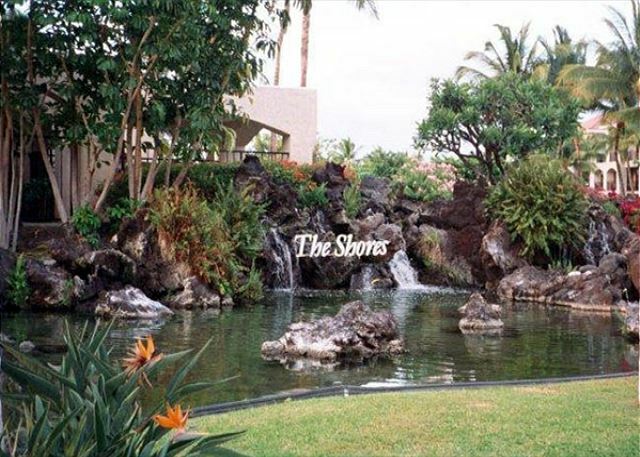 It was our third time in the Shores. 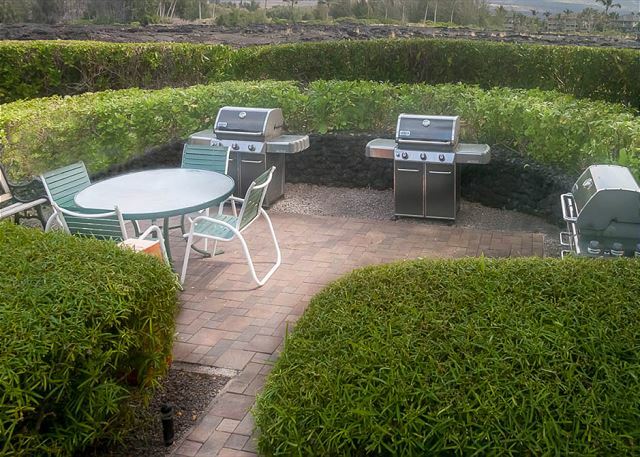 We booked again through Waikoloa Realty and they provided an excellent service. When we stepped into the condo we immediately felt like coming home. Hopefully we will return next year. This is our 3rd time staying in this condo, and certainly not the last. 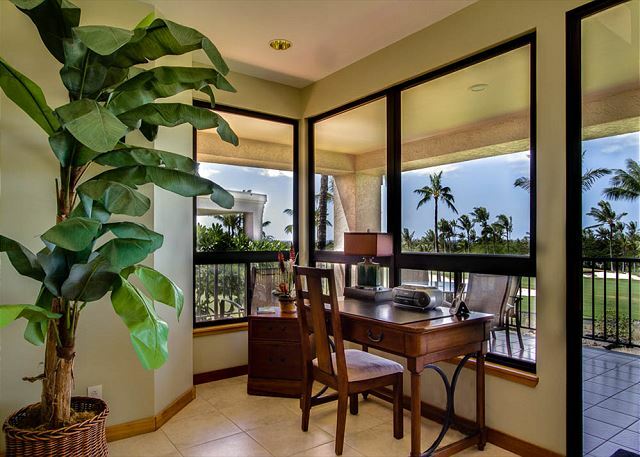 It’s clean and comfortable and the lanai views are amazing. 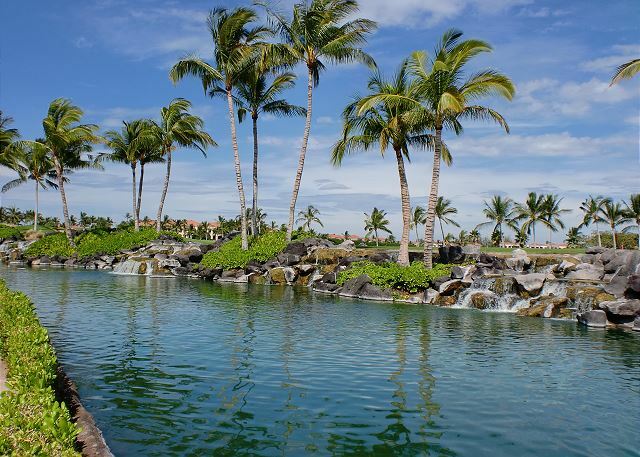 It’s a perfect home base for us as we enjoy the big island, our home away from home. Peggy is always SO helpful as well. We’d highly recommend this condo! We absolutely love this condo and this complex. It is our third stay here. 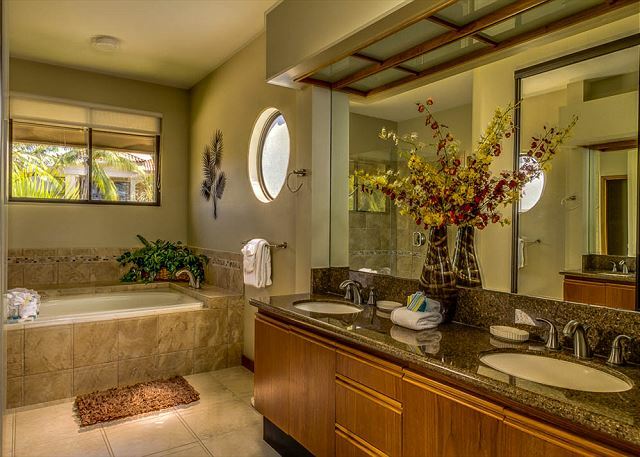 It is spacious and airy, with a beautiful unobstructed view and incredible sunsets. The property was very clean, and the property management is wonderful to deal with (very quick and responsive to questions/inquiries, super efficient wrt to booking etc). I marked the condition down a bit as the sofa is just starting to look a bit "tired". You were a dream guest, and thank you for your nice review. You can't beat the golf villas for their beautiful open vistas and Villa 7 is one of the best. We look forward to having you back! As always working with Waikoloa Realty was a pleasure. Peggy is efficient and always goes the extra mile to make their guests comfortable and welcome! We had a relaxing , comfortable, stay. 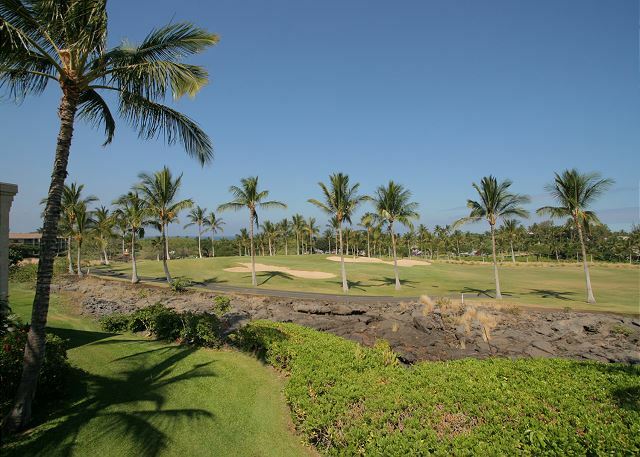 the spacious terrace that overlooks the golf course is where we enjoyed all our meals. We've been returning here for almost 30 years. Needless to say, we like it a lot ! 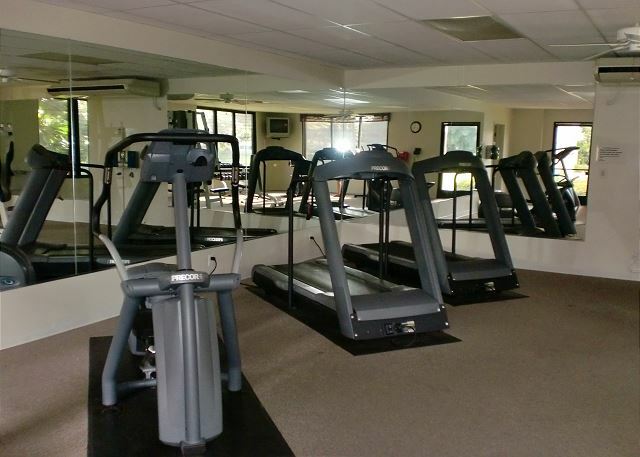 The condo is spacious, comfortable, and well-kept. Attentive service from Peggy a big plus. We loved this condo! The rental process was simple and dealing with Peggy was a breeze. She was easy to reach via phone call or text to answer any of our questions. The property description and pictures are accurate. 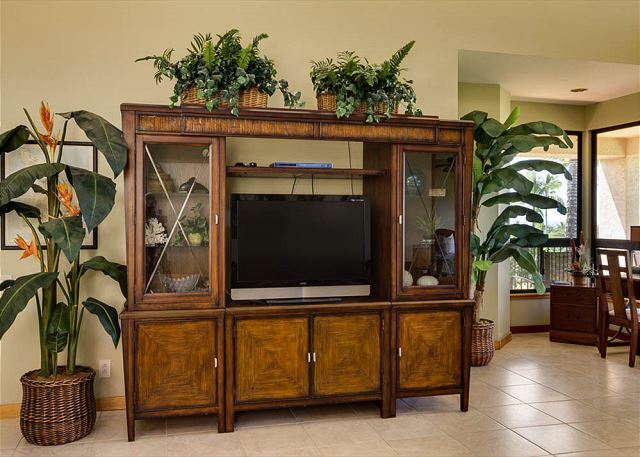 The condo is very roomy and comfortable with two large master bedrooms on opposite sides of the living room. The large lani was our favorite spot to spend our time. 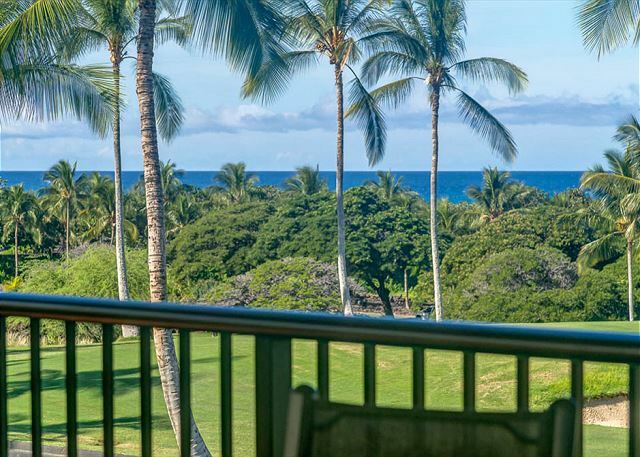 You can see the ocean over the tree tops from the lani (as the pictures show on the website). Having previously rented condos that face west toward the water we knew that the sun would be strong and hot on the lani in the 3 hours before sunset. This condo does not have any window coverings or drapes in the living room that would allow you block out the sun. That made getting out of the glare of the setting sun a little uncomfortable for a few hours each day. Despite the lack of window coverings in the living room I recommend this condo and would stay here again. This property is on the second floor and does not have an elevator. This unit is not recommended if anyone in your party is unable to manage stairs.